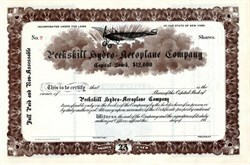 Beautiful unissued stock certificate from the Peekskill Hydro-Aeroplane Company dated 191X. This historic document was printed by the Broun-Green Company and has an ornate border around it with a vignette of an early monoplane. This item is over 99 years old. The company was to build a new cylindrical controlled monoplane.